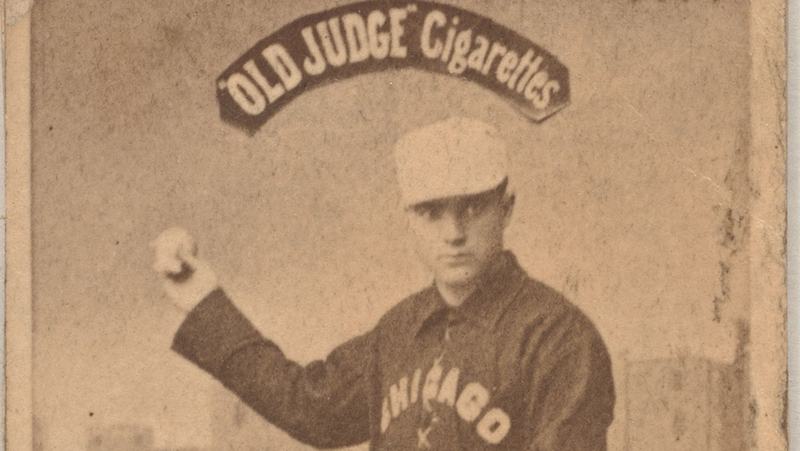 Sam Barkley was a passable infielder from baseball’s early years in the 1880s. Like many of his peers, he suffered from a career-ending knee injury, chronic unemployment, and being stricken with quinsy. Unlike many of his peers, his wife was seduced by an Irish crime lord. None of the pain of his tonsil infection or fluctuating weight is visible in his baseball card, a yellowed, sepia-tone piece of stock paper portraying him with his arm reared back and his mustache bristling, but without it, we may have never known his name. And now, transported through time, he has been handled, digitized, and displayed behind glass at the Library of Congress in a world he could never comprehend. But Barkley, and 2,100 other ball players from his era, are helping us learn a little more about the world from which he came. Peter Devereaux, a writer-editor at the Library of Congress, used to marvel at the Don Mattingly rookie card in his childhood baseball card collection. Thumbing through a Beckett Baseball Price Guide, he discovered it was worth an amount that blew his preteen mind. Now, Devereaux has access to baseball cards a bracket or two higher in the price guide: a collection from 1887-1914, the industry’s first generation, which served as the subject of his book, Game Faces: Early Baseball Cards from the Library of Congress. Many of the cards featured in the book, such as those displaying Ty Cobb, Christy Mathewson, Honus Wagner, and even Sam Barkley, are on display in the library’s Baseball Americana exhibit through June 2019. Bars were where baseball card collectors gathered back then, but not to trade them or listen to a lecture. They were there to peel them off the floor. After a couple of drinks on Saturday night, bar patrons would go for a smoke, tear open a new pack of cigarettes, and find Mathewson or Cobb looking back at them. They’d toss the card on the floor, where it would stick to the piss and booze until morning, when children would appear, offering to sweep the floors in hopes of collecting the previous night’s bounty. Of course, with children also serving as factory laborers, in this time before modern labor laws, cigarettes were also being marketed directly to them, with the trading cards doing most of the heavy lifting until the nicotine addiction could take over. One way or another, children wound up with trading cards portraying not just ball players, but boxers, bicyclists, oarsmen, burlesque dancers, and vaudeville actresses. Benjamin K. Edwards, a lumber magnate, had taken a shine to the collectable cards when everyone else was leaving them on barroom floors. He passed them on to his daughter, who handed them off to Carl Sandburg, Pulitzer Prize winning poet (twice) and biographer (once). It was Sandburg who donated them to the Library of Congress in 1954. As a writer-editor for the Library of Congress, Devereaux’s job is to tell the story of anything in the library’s collection. By the time he was asked to speak about Game Faces on a SABR panel in Cooperstown, he had moved onto Mesoamerican cave art. But as a fan of baseball, history, and the endless collisions between the two, Devereaux went about his work with one eye on the ancient collection of baseball cards. Given the chance to write Game Faces, Devereaux leaped at the opportunity. The cards offer a two-and-a-half by one-and-a-half-inch glimpse through time; not quite a door to the past, but perhaps a peek through the mail slot, allowing us a brief view into an era we’ll never see and of careers long forgotten. They served a similar purpose in their own time, as well. Cards were novelties for children, sure, but also provided less available information to fans, such as what a player looked like, or what team he played for. A Billy Sunday card, featured in Game Faces, shows the crudely administered alterations of the times, as Sunday had been traded from Chicago to Pittsburgh midseason, forcing some artist to come in on a Saturday and change the name on Sunday’s uniform by hand. Like any marketplace, there was a gold standard. Beautiful artistry and accurate depictions of players became the reputation of the Old Judge sets. “A sprawling, whimsical photographic record of late nineteenth-century baseball,” Devereaux writes. “But at the same time, there were also crappier sets,” he says. 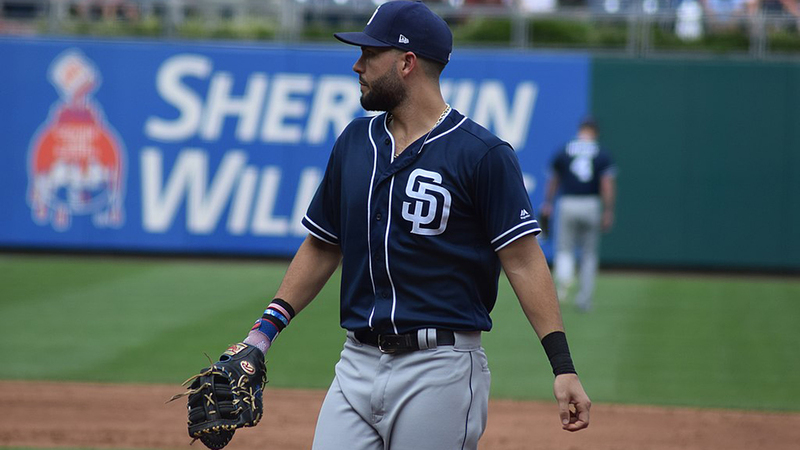 He points at a series in which one company used the same figure, in the same pose, to illustrate several different players, bothering only to change the color of the uniform. “This is one of my favorites,” he says, pointing to another. “There were all these minor league teams in the Carolina leagues. Well, they’re just rife with errors. First of all, there’s no player by this guy’s name that ever existed in baseball, and this team didn’t exist in this year,” he says, laughing. Kids from a century ago might have had callused hands and smoker’s breath, but they knew when they were getting ripped off. It was their standards that manufacturers knew they had to meet, and eventually, they learned how to keep their consumers happy. Across the top of Devereaux’s eight-year-old son’s dresser is a private hall of fame: Mike Trout and Adam Jones are the most prominently featured exhibits, while other members have been relegated to the Bedroom Floor Annex. Justin is a writer and editor for The Good Phight and a contributor to Baseball Prospectus. He is known in his family for jamming free hot dogs in his pockets during an off-season tour of Veterans Stadium and eating them on the car ride home. So do we have a picture of Sam Barkley, man of a thousand misfortunes? Billy Sunday, who’s depicted in the card at the top of the article, had (I’ll say arguably, just in case) the most extraordinary post-baseball career ever. After he left the game, he turned himself into a roving evangelist who attracted massive crowds with his high-energy oratory and show-stopping gyrations — Billy Graham mixed with James Brown. His plain-speaking preaching (lots of warnings about sin and damnation) attracted 100 million people, it’s said, of whom one million supposedly converted on the spot.